Three of these involve the world of sport and one of these has become the subject of a recent motion picture. I should mention that the dreadful circumstances surrounding the Zephyr is being considered by Troma Entertainment as the subject of a new film. The working title is THE TOXIC AVENGER PART IV: ED VERA'S REVENGE. If this story is brought to the screen I predict it will traumatize an entire generation of both cineasts and motorists. Having said this, the money received for the story rights would help soothe the emotional pain I have endured these past 35 years and so I really don't care. You see, I always kinda rooted for Marshall and, since 1970, I have become a huge fan of the Thundering Herd. I like the team name despite my reservations that buffalo ever roamed the mountains and valleys of West Virginia. I also admire their inspiring return to gridiron glory -- SMU's "death penality" was nothing in comparison to the tragedy suffered by Marshall and the Ponies still find themselves mired in mediocrity. Imagine the horror, then, when I learned that Warner Brothers had selected Matthew McConaughey to play Coach Jack Lengyel, the key role in WE ARE MARSHALL. What could they possibly be thinking? Matthew McConaughey as a hard-nosed football coach? My initial thoughts were that Brian Boitano must not have wanted to do the film or that Milton Delugg wanted too much money or that Jerry Espenson was simply unavailable. Heck, if Ed Vera wasn't in hiding they could have given him the part. It seemed that a decision this bad simply had to be made in concert with the Bush Administration as well as the 110th Congress. 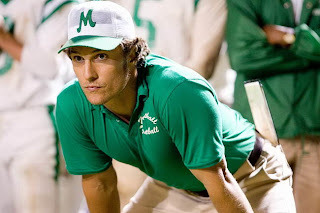 I repeat, McConaughey as a hard-nosed football coach? Jeez-oh-flip, even the previews made it seem like Mr. McConaughey was going to come across as nothing more than a Thundering Nerd. McConaughey does far more than a creditable job as Coach Lengyel. 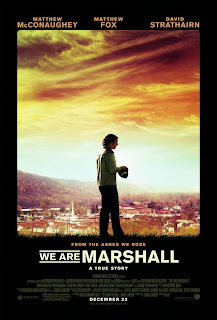 To be honest, his quirky, off-kilter performance is one of the strengths of WE ARE MARSHALL. In fact, the entire cast is excellent, with Matthew Fox as Assistant Coach Red Dawson, the always-reliable David Strathairn as President Dedmon, Ian McShane as Paul Griffen and Kate Mara as Annie Cantrell deserving special mention. The same holds true for my good friend Mike Pniewski who portrays Bobby Bowden, the coach of the rival West Virgina University Mountaineers. It is nothing short of remarkable that Coach Bowden actually gave the Marshall coaching staff full access to his playbook and game films so they could adopt the Veer Formation for their offense -- as a result I have admired Bowden ever since. Can you even imagine Jackie Sherrill or Barry Switzer doing something so unselfish? I didn't think so. 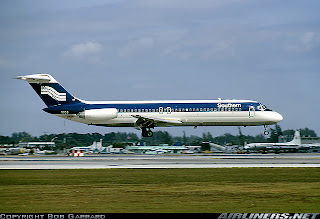 Southern Airways Flight 932 was a chartered DC-9 that crashed on a non-precision approach under stormy weather conditions on that fateful night in November, 1970. All 75 souls on board were killed -- thirty-seven players, eight members of the coaching staff, twenty-five boosters, four flight and crew members and one employee of the charter company. Among the boosters were four of Huntington, West Virginia's six physicians, a city councilman and a state legislator. This devastating loss to both the university and the community provides a complex and challenging story to tell. Director Joseph McGinty Nichole seems an unlikely candidate for this type of film. His previous credits consist primarily of the two CHARLIE'S ANGELS features and while he fumbles the ball on several occasions, WE ARE MARSHALL remains a solid, emotionally-charged sports-themed weepie that succeeds despite the use of an overbearing, soaring musical score and a parade of lame K-Tel "Semi-Classic" rock songs which pop up on cue. Yes, the filmmaking is as formulaic as it gets and the on-the-field football scenes often look like they were staged by Josh Blue. Despite these procedure penalties WE ARE MARSHALL scores just enough to be a winner; you best have a Kleenex or two standing by. We Are Marshall is a bit of a shame, because the subject matter could have been something special in the hands of stronger filmmakers.